Fonzarelli's is a brand new franchise inspired by the famous sitcom Happy Days. 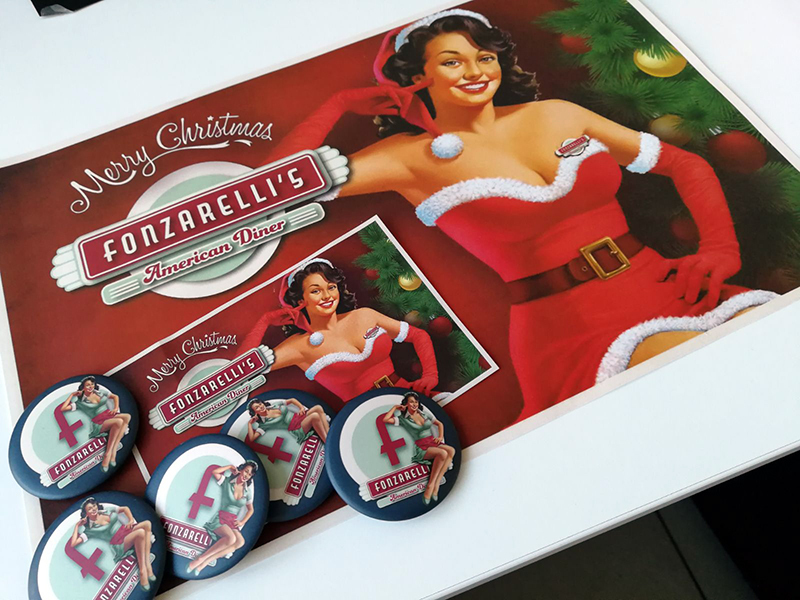 To launch the brand, Fonzarelli's chose badges and magnetic bottle openers with their logo. Fonzarelli’s has a very unique style. To what extent is it important to keep this style for your merchandising items also? The Fonzarelli’s image and style have been designed with great care and attention to detail. We’ve not left anything to chance: that’s how we managed to bring back, stylishly but also with a touch of modernity, an era that everyone remembers with fondness even if they didn’t experience it themselves: the “Happy Days” 50s. Our brand, our colours and our facilities are designed to create a pleasant and relaxing environment, suitable for any age. We want spending time inside a Fonzarelli’s venue to be a fun experience both for those who go in there with friends and for those who go as a family. That’s why every aspect of the Fonzarelli’s brand must go hand-in-hand with this philosophy and always reflect the values that we outline during the development of the project. Of course, this also applies to the merchandising items that we make, because these items represent the company and they get across the messages we want to send out. Which items did you create with Camaloon? What will you be using them for? 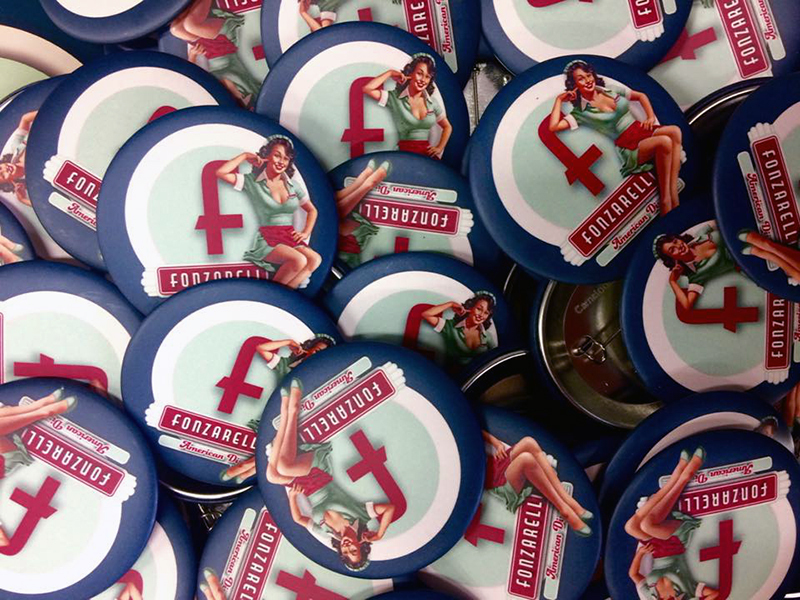 At Camaloon we made badges and magnetic bottle openers with the Fonzarelli’s logo. We’ve been handing them out during some of the brand’s promotional events. They've been really popular due to how original they are as well as their graphic design. It’s important to remember that merchandising items serve two purposes: the client can keep them as a reminder of the positive experience they had or, as in this case, they serve to increase the brand’s popularity. For when we open the first two Fonzarelli’s in Limena (Padua) and in San Donà (Venice) in spring, one of the options we're considering is to include a shop dedicated to selling items in the restaurant: we believe that the franchise could really do with a brand store capable of setting a trend. To what extent is it important for Fonzarelli’s to find products that can convey and represent the “Happy Days” notion? More than the actual series itself, it’s important for Fonzarelli’s to recall the era in which the series was filmed. We want having lunch or dinner inside our stores to be a real experience, a sort of throw-back to the 50s in a setting that’s modern and comfortable but that also has a strong character.We’ve conveyed our philosophy through all aspects, from advertisement down to the furniture, matching the style and spirit of that time period. That’s why it's essential for us to study and find products that bring it back with style, designs and materials. This is of course due to the fact that the display of our values and our style must always be consistent and never stray from the ideas that gave rise to the Fonzarelli’s project. What have you liked most about Camaloon’s products? We found the essential qualities that we were looking for in a provider: quick delivery, variety and attention to detail when it comes to products, and an excellent quality to price ratio. These were the three aspects that impressed us most about Camaloon’s products and services and which led us to choose them as a provider for Fonzarelli’s brand. Another important aspect was the ease at which we were able to look for what we wanted from the web page: we quickly found the products that best suited our requirements and we were very impressed by the quality of the personalisation process that was carried out for us. The overall impression was therefore extremely positive.